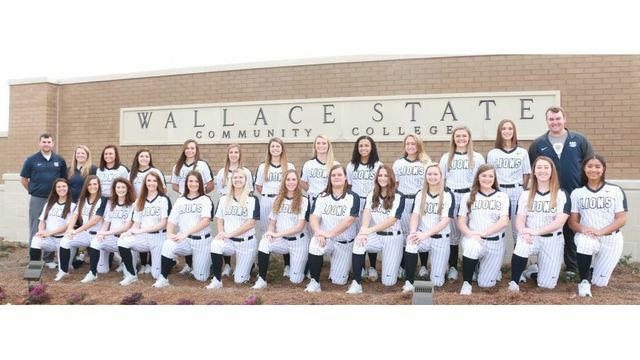 HANCEVILLE, ALA. (WALLACE STATE ATHLETICS) -- Wallace State’s softball team opens the 2019 season today in Panama City, Fla., with a roster featuring 14 sophomores, including a bevy of returning experience. Daugherty, who has an 86-31 record in two seasons at Wallace State, also led the team to its 12thappearance at the NJCAA Division I National Championship, where the Lions won their first national championship game under him. Overall, the Wallace State softball program has won two national titles. Picture: Wallace State’s 2019 softball begins the season today in Panama City, Fla. Members of the team are, front row, from left, Lauren Keplinger, Chaney Phillips, Sidney Edwards, Callie Ryan, Kalynn Holcomb, Mabry Norris, Meagan Schwieterman, Addie Robinson, Lauren Quigley, Gabby Hilliker, Hannah Ingram, Katie Burden and Kaley Anthony; back row, from left, head coach A.J. Daugherty, assistant coach Sallie Beth Burch, Morgan Weatherwax, Sydney McKissick, Becca Feazell, Riley McWaters, Jordan McMeans, Keeli Bobbitt, Alysia Anderson, Taylor Goodpastor, Katelyn Williams, Katie Wood and manager Carson Owens.